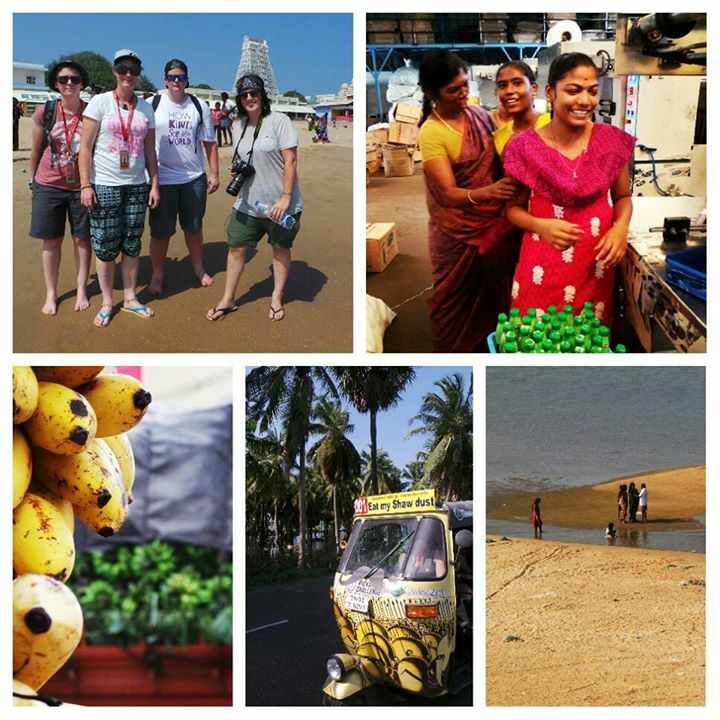 Coconuts, potholes and hidden lagoons, today’s Rickshaw Challenge activities took our participants off the beaten track into the heart of rural India, to shore temples and sacred elephants, so far off the tourist route that you become the attraction. Based for two nights in the fishing city of Tuticorin, our Rickshaw Challenge participants got a list of surprise challenges for the day, with most of the surprises being more bad roads. After the briefing, everyone headed off in their rickshaw and I tagged along with the Flying Kiwis for the day, who made a convoy of New Zealanders with team Eat My Shawdust. We sped through the streets of Tuticorin in a parade of rickshaws to the VVD coconut oil factory. The kilos of halved coconuts that lie spread out drying in the sun is the secret to the quality of VVD’s coconut oil, who are one of India’s most popular manufactures. While some oil companies dry the coconuts artificially, the coconuts here brought from the plantations in Kerala and Tamil Nadu and are left out to dry in the sun. The factory runs on steam, where the coconuts are then sent through a conveyor belt of machines to press and then later purify the oil. We paid a visit to the factory upstairs to say hi to the women packing and bottling the product. The factory’s ladies range in ages from young to old and all sport traditional saris and colourful dresses. Once we left the factory, things got a little interesting. 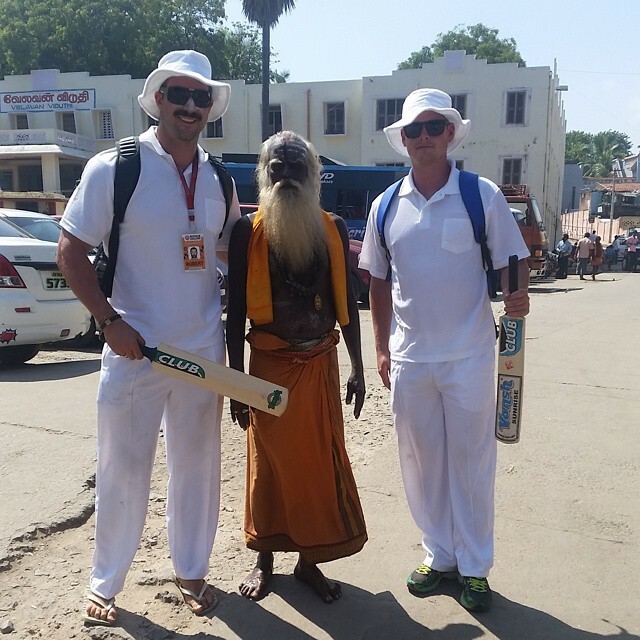 Our next port of call was the Tiruchendur Temple further down the coast, but the kiwis got confused just getting out of Tuticorin. “We’ll find the way, I’ve got Google maps on,” Claire from the Flying Kiwis told us. Immediately, I knew we’d get lost. Google maps doesn’t really work in India. Snippets from the road with the kiwis. Of course we ended up trotting down side streets, going the wrong way or attempting to go down a one way street. We found ourself back at the hotel and decided it was a good call to run up, grab stuff and check our tires. 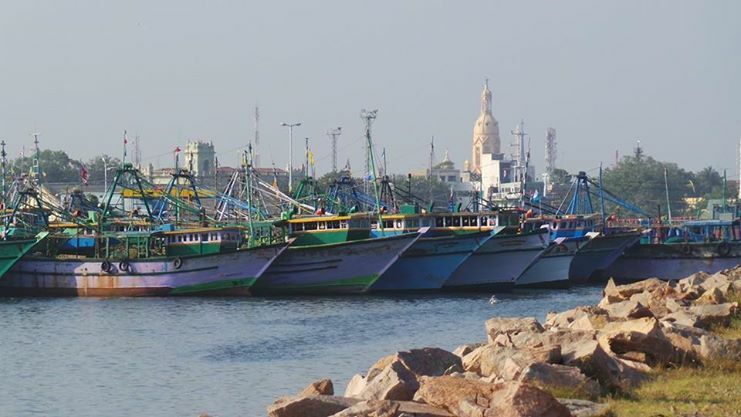 The only disadvantage was we left Tuticorin an hour after most of the teams. We sped off down bumpy tracks into rural India, passing children and curious locals fascinated with the bright green rickshaw and its three-wheeled friend pimped out with a 300 themed paintjob. I’ve noticed the more rural and remote the region, the more the fascination with those of a different race. People rush up to us asking for photos, asking for us to pose with them. Five white women stuck out like a sore thumb in the town midway, when we stopped to cool the rickshaw and have a banana to keep us going, Bananas in India are not your supermarket affair, but come on its bark and picked straight off. They’re tiny and extremely sweet. Today, our route took us into the heart of banana country, as we passed plantations while skimming potholes. Cruising through roads, we skirted backwaters I more likely expected to find in Kerala and eventually made it to the temple town. The sun burned down, a shock after the cool weather we had to endure during the cyclone, and we set out to find the challenges, which involved finding out more about the temple and a search for an elephant. The temple dedicated to the peacock god Lord Marunga Perumal and is actually once of the largest temple complexes by area and also India’s most visited – however it’s so far off the tourist track that it doesn’t even get a mention in Lonely Planet. It spreads out in white behind the sandy beach filled with splashing children and women in seawater soaked saris. A quick glance up the beach, and you’ll still see cows and goats hanging around the yellow sands. 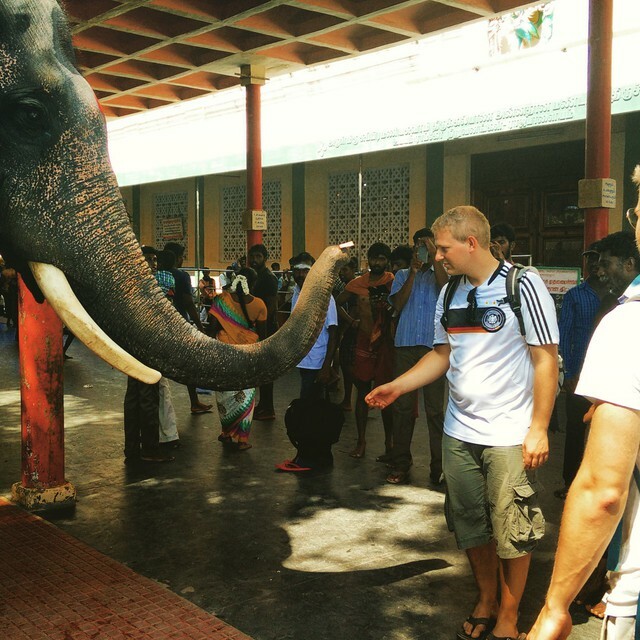 Culture clash between the Bavarian Barbarians and an Indian elephant. We decided not to enter the temple, but we did find the 12-year-old sacred elephant called Kumaran that lives on the temple grounds. 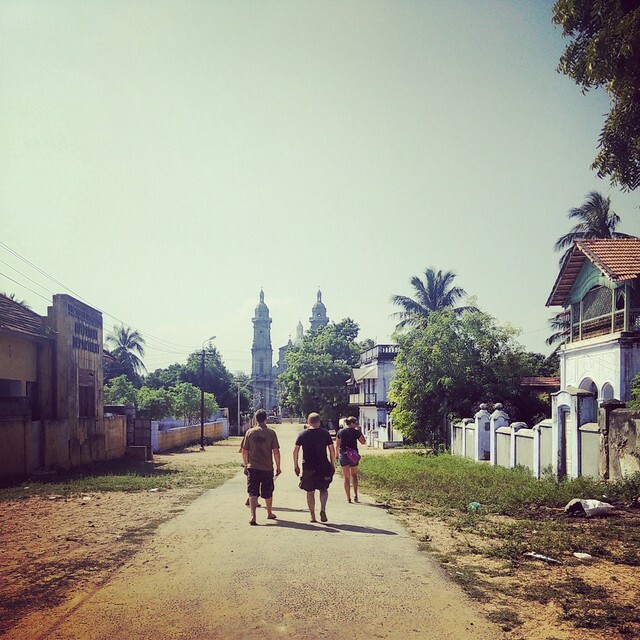 After a spot of lunch, we raced down the coast on our rickshaws, passing stunning backwaters filled with palms, we arrived at the village of Manapad. With towering church spires and colourful houses in winding streets, it felt like jumping through a wormhole over to Portugal, until our rickshaw gets mobbed with children asking for sweets, stealing our cashews and our beach ball. We drove off in search of the answer to today’s challenge, with views long patches of golden beach, set to the backdrop of the town’s unique churches and its blue lagoon. On the top of a rocky outcrop with views across the bay, the Holy Cross Church is still and active place of worship even today. 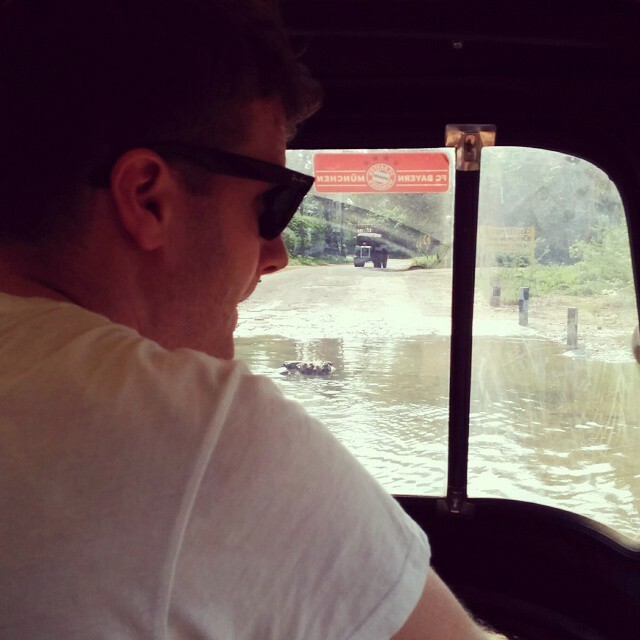 Although, parking our rickshaws we became a tourist attraction in minutes, as the locals immediately surrounded us. “Off the beaten track they said….” photo by Barnabas Kittlaus from the Bavarian Barbarians. The golden light across the bay reminded us we had only a couple of hours to make the flagdown time at the hotel at 5pm, so we skipped the third task and never made it to the Vanathirupathi Punnai Nagar temple. We sped back over the bumpy country roads, making it back to Tuticorin an hour late. Overall, it was a relaxed day, no significant incidents on the road to speak of, although that might be because Dukes of the Green decided to take it easy and stay back at the hotel. Are you crazy enough to come along for the ride? Then join us on the next Rickshaw Challenge. Then get a team together and lets see you at the starting line! If you want to join us in spirit, like us on Facebook or follow us on Twitter or Instagram to keep up with our latest antics.